17. Particle and droplet actuation: dielectrophoresis, magnetophoresis, and digital microfluidics; Appendices: A. Units and fundamental constants; B. Properties of electrolyte solutions; C. Coordinate systems and vector calculus; D. Governing equation reference; E. Nondimensionalization and characteristic parameters; F. Multipolar solutions to the Laplace and Stokes equations; G. Complex functions; H. Interaction potentials: atomistic modeling of solvents and solutes. Brian J. Kirby Cornell University, New York. 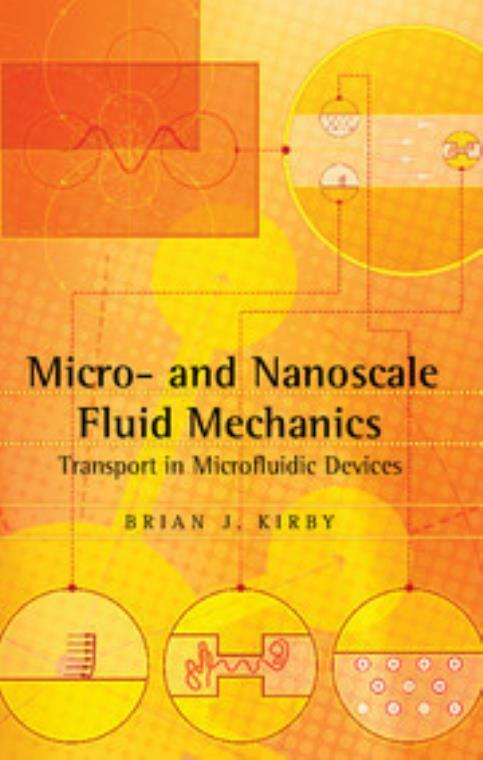 Brian J. Kirby currently directs the Micro/Nanofluidics Laboratory in the Sibley School of Mechanical and Aerospace Engineering at Cornell University. He joined the school in August 2004. Previous to that, he was a Senior Member of the Technical Staff in the Microfluidics Department at Sandia National Laboratories in Livermore, California, where he worked from 2001 to 2004 on microfluidic systems, with applications primarily to counterbioterrorism. Professor Kirby received a 2002 R&D Top 100 Invention Award for work on microvalves for high-pressure fluid control, a 2004 JD Watson Investigator Award for microdevices for protein production and analysis, and a 2006 Presidential Early Career Award for Scientists and Engineers (PECASE) for nanoscale electrokinetics and bioagent detection. He teaches both macroscale and microscale fluid mechanics, and received the 2008 Mr and Mrs Robert F. Tucker Excellence in Teaching Award at Cornell University.